In his 2001 essay “Faith and Knowledge,” Habermas quotes the late Max Horkheimer (1895-1973), who wrote, “Knowing there is no God, it nevertheless believes in him.” The “it” in this sentence is in reference to Critical Theory, or at least to the Frankfurt School variety, of which both men are leading representatives of the first and second generation respectively. As one of the most celebrated philosophers in contemporary Europe, it is worth considering how this idea is taken up in Habermas’s work and how it might, in turn, be appropriated, modified or rejected in relation to the study of religion. The “Frankfurt School” is a term used to describe thinkers that came out of the Institute for Social Research that was founded in 1923 in Frankfurt, Germany, and includes such philosophical luminaries as Max Horkheimer, Theodor Adorno, and Herbert Marcuse. Reacting to the then-dominant philosophical schools of neo-Kantianism and logical empiricism, the Frankfurt theorists sought to combine the dialectical tradition of Hegelian-Marxism with the social sciences, along with the thought of less mainstream philosophers like Friedrich Nietzsche. This interdisciplinary approach, it was believed, could help not only in building a more robust theory of society, but also help to change it for the better. After the Second World War, during which time Horkheimer and Adorno were living in exile in the United States (both were secular Jews), they became skeptical about the practical aims of critical theory, as was evident in their 1947 book Dialectic of Enlightenment, where they argued that the Enlightenment ideal of reason had given birth to its own myth of a cold, instrumental rationality, which had culminated in the horrors of Auschwitz. For this reason, they came to the conclusion that the critical theorist must return to the more humble task of pointing out examples of “false consciousness” in hopes that these “messages in a bottle” could some day be read. For Habermas, who came of age in the late 1940s and began to distance himself from Horkheimer and Adorno in the 1970s, this was a wholly pessimistic diagnosis of modernity as it ignored the many gains that had come about since the 17th century, such as the functional separation of church and state and the formal granting of equal rights and protections under law to greater numbers of people. For this and other reasons, he argues that it is not just “instrumental rationality” that characterizes the dialectic of enlightenment, but also “communicative rationality,” which can be seen in the human capacity for self-reflection and to learn from past mistakes. 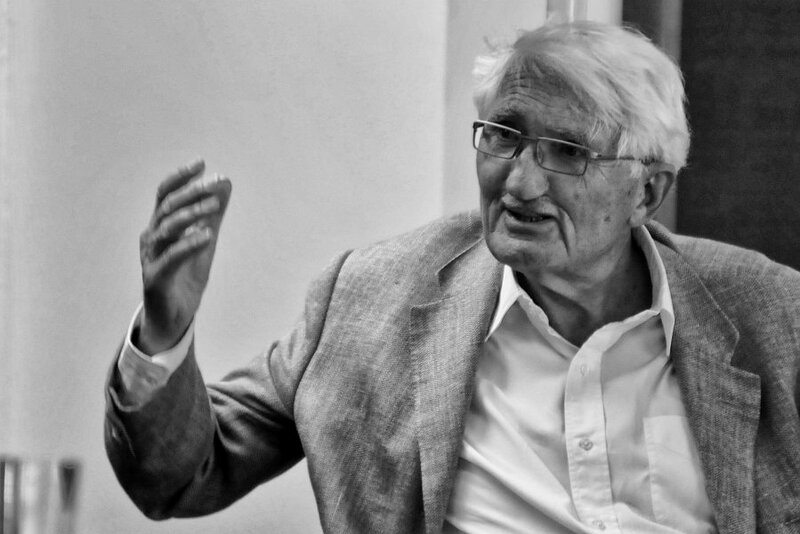 It is thus crucial, according to Habermas, for a critical theory to investigate how human societies can maximize these capacities on the personal, social and political levels, which is why he has long focused his energy on the question of how to create and maintain a radically open and robust public sphere, where people from different background cultures, religious or otherwise, can engage one another in order to find common ground and forge bonds of civic solidarity around common interests and concerns. Since the events of September 11th, 2001, Habermas has begun to pay closer attention to the role of religion in the public sphere. Looking to account for its’ apparent resurgence he now refers to most Western societies as “post-secular,” where religion continues to exist and assert its’ influence amidst on-going and uneven processes of secularization. This sociological perspective has, in turn, informed his political theory, where he now argues for greater inclusion for religious voices within the public sphere. Perhaps most controversial, he has returned to reflect on the (potential) existential value of religious worldviews and argues that secular culture still has something to learn from religion in a postmetaphysical world. In case it is not painfully clear, Habermas is not a scholar of “religion.” He does not take-up the term critically, examine its’ uses in various contexts, nor ask what interests are being served when it is deployed by various social actors. His concerns are rather philosophical (e.g., the dialectic between faith and knowledge, religion and naturalism), sociological (e.g., how are religious groups and institutions located within the modern world) and political (e.g., how to achieve mutual recognition for competing worldviews within modern pluralistic societies). In this sense, Habermas does not bare the same burden as the critical scholar of “religion,” but rather exists as a particular variant of critical theory with a strong interest in religion and the public sphere. For the scholar of religion, there are at least two potential avenues in approaching Habermas’s work. The first is to work in the service of Habermas, bringing to bare one’s expertise in the field of religion so as to improve the ways in which he situates religion within his broader social and political theory. The second is one of critique—to highlight the ways in which he has appropriated concepts and frameworks uncritically, as though they are natural categories instead of contingent and shifting modes of signification. There is also a third avenue that seeks to do both, which is the one that I would like to defend here. To be clear, my goal is not to argue for the value of Habermas’s theory of religion for the study of religion, though some of his insights may be relevant, but rather to enter this matrix, in part, in the service of political theory. Being thrown into a pit of snakes, one cannot but help offer solutions so as to how we might escape. From the position of the scholar of religion, however, I have no such aspirations. In this capacity, Habermas’s work, dealing with concepts like salvation, redemption etc., is an object of study in and of itself and one that is hopefully fruitful to undertake given his immense influence over the last 50-odd years. Since there are “a lotta ins” and “a lotta outs” to this theory, to quote the Big Lebowski, I will divide my argument in a series of posts by looking at Habermas’s treatment of religion via sociology, political theory, and philosophy respectively. With this more comprehensive picture in place, I will then offer a concluding post that seeks to critique Habermas’s theory from the perspective of the (critical) study of religion. As all of this is part of my PhD thesis, comments, suggestions, etc., would be greatly obliged. This entry was posted in Matt Sheedy, Politics and Religion, Religion and Society, Religion and Theory, Theory and Method, Uncategorized and tagged Critical Theory, Habermas, Philosophy, Religion, sociology. Bookmark the permalink.